This was written by a raving fan! I have always enjoyed my summer vacations at Myrtle Beach. It’s one of my favorite places when it comes to spending quality time with my family. While I was still a novice in jet skiing, the Myrtle Beach Jet Ski Rentals always came handy. The dolphin watch trip was and is still one of my family’s favorite activities. In order to avoid the last minute rush, I have always reserved my jet ski well in advance. This way, I’m able to get highly cost-effective deals and also have peace of mind as the summer approaches. The last thing you want is to be wasting time looking for a jet ski well into your vacation when everyone else is at the beach. Booking your jet ski early means you won’t have to be scrambling at the last minute only to find none available. Once you have reserved your jet ski, you definitely know that your Myrtle Beach vacation will be stress-free. It’s only then that you can sit back and fantasize about the amount of fun you are going to have at Myrtle Beach. When you plan ahead, you stay ahead. Most early booking discounts always expire as the holidays approach. If you are a bargain hunter like me, this is definitely the best time to strike. If you want to secure your preferred jet ski, you really have no choice but to book early. Jet skis are like a beachfront space; they have a finite number and always get booked out very quickly. When you book early, you have every chance of finding the most suitable jet ski at Myrtle Beach for the number of people you want it for. Summer is almost upon us. If summer is not already on your mind, you risk being left out in terms of jet ski availability and savings at Myrtle Beach Jet Ski Rentals. Time really does fly. This is the best time to reserve your jet ski if you want to avoid being stranded on Myrtle Beach without a jet ski. Why is renting a jet ski so popular? 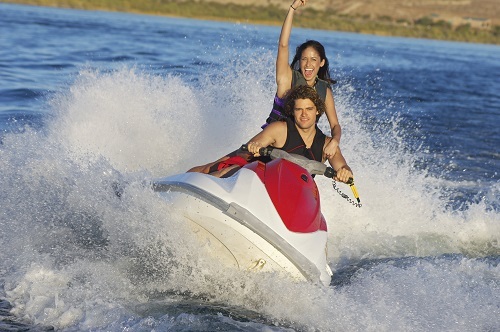 As more and more people are developing an interest in jet skiing, jet skis are becoming a prized possession for many. However for those who, for one reason or another, cannot own these watercraft, renting one the other viable option. There are many reasons why most people choose to rent a jet ski instead of buying one. One of the biggest reasons is affordability. It doesn’t make sense to spend a lot of money to purchase a jet ski that will only be used occasionally. Most rental services also offer first-time users tutorials. Renting a jet ski allows you to learn the ropes and know whether you are ready to go on a jet ski ride on your own. Jet skiing at Myrtle Beach is no doubt one of the best and fun-filled ways to relax alone or with your family. Visit www.actionwatersportz.com to reserve your jet ski now and expect an unforgettable jet skiing experience during your vacation.